Wake up and witness radiant, energised skin. 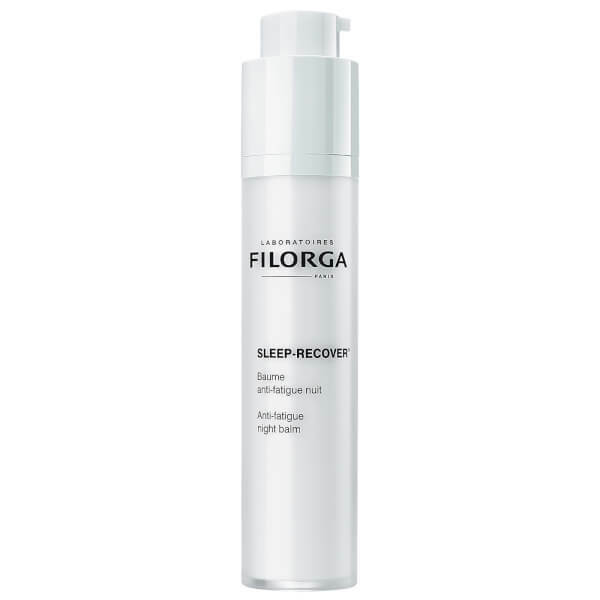 Filorga's Sleep-Recover Treatment is a regenerating night balm that works with your skin during its most receptive hours to combat signs of fatigue. Helping to revitalise and re-energise your complexion, the formula contains decongestant Horse Chestnut extract to reduce under eye puffiness and shadows, whilst Hyaluronic Acid and a latest generation molecule 'restructure' the dermis to ease the appearance of fatigue lines. Promoting smoother, well-rested skin, the balm utilises NCTF® to reactivate support fibres that ensure signs of fatigue won't permanently settle. Over time, skin appears firmer with enhanced radiance and resilience. Apply in the evening, after washing the skin. Massage in. Aqua (Water), Glycerin, Butylene Glycol, Dicaprylyl Carbonate, Isododecane, Albizia Julibrissin Bark Extract, Propylheptyl Caprylate, Methyl Methacrylate Rosspolymer, Hydroxyethyl Acrylate/Sodium Acryloyldimethyl Taurate Copolymer, Cetyl Ethylhexanoate, Imperata Cylindrica Root Extract, Pentaerythrityl Tetracaprylate / Tetracaprate, Dimethicone, Propylene Glycol, Dimethicone / BIS-Isobutyl PPG-20 Crosspolymer, Parfum (Fragrance), Stearalkonium Hectorite, Glucosamine Hcl, Pisum Sativum Xtract, Peg-60 Hydrogenated Castor Oil, Sucrose Palmitate, Decylene Glycol, Bambusa Vulgaris Leaf/Stem Extract, Glyceryl Linoleate, Polysorbate 60, Sorbitan Isostearate, Xanthan Gum, Escin, CI 77891 (Titanium Dioxide), Silica, Prunus Amygdalus Dulcis (Sweet Almond) Oil, Biosaccharide Gum-1, Phenoxyethanol, Caprylyl Glycol, Carbomer, Glyceryl Caprylate, Sodium Anisate, Sodium Levulinate, Sodium Hyaluronate, Sodium Benzoate, Phloridzinyl Glucoside, Methylisothiazolinone, Tocopherol, Potassium Sorbate, Citric Acid, Alumina, Acrylates / C10-30 Alkyl Acrylate Crosspolymer, Edta, Sodium Chloride, Glucose, Potassium Chloride, Calcium Chloride, Magnesium Sulfate, Glutamine, Sodium Phosphate, Ascorbic Acid, Sodium Acetate, Lysine Hcl, Arginine, Alanine, Histidine, Valine, Leucine, Threonine, Isoleucine, Tryptophan, Phenylalanine, Tyrosine, Glycine, Polysorbate 80, Serine, Deoxyadenosine, Cystine, Glutathione, Cyanocobalamin, Deoxycytidine, Deoxyguanosine, Deoxythymidine, Asparagine, Aspartic Acid, Ornithine, Glutamic Acid, Nicotinamide Adenine Dinucleotide, Proline, Aminobutyric Acid, Methionine, Taurine, Hydroxyproline, Glucosamine, Coenzyme A, Glucuronolactone, Sodium Glucuronate, Sodium Uridine Triphosphate, Thiamine Diphosphate, Disodium Flavine Adenine Dinucleotide, Nicotinamide Adenine Dinucleotide Phosphate, Retinyl Acetate,Inositol, Methyl Deoxycytidine, Niacin, Niacinamide, Pyridoxal, Pyridoxine, Biotin, Calcium Pantothenate, Folic Acid, Riboflavin, Tocopheryl Phosphate.